Kevin Keegan may have described the Premier League as "boring", but with the title race going down to the wire for the first time in years, few could dispute the 2007-08 season has given us the odd bit of excitement. From the dramatic exit of Chelsea boss Jose Mourinho to the long-running American soap opera at Anfield, there has been plenty for fans to get their teeth into - and for players, managers and pundits to give us the benefit of their wisdom. BBC Sport rounds up some of the more memorable quotes from the season. "Just keep smiling, Alex" - "Yes dear." "That wife of mine just bullies me, She throws me out of the door at seven o'clock every morning! So that's a definite no. Oh no, I dare not risk the wrath of that lass from the Gorbals." 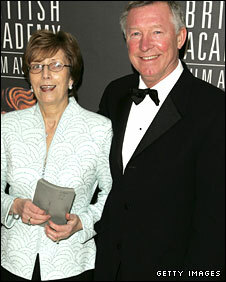 Manchester United boss Sir Alex Ferguson claims that it's his wife Cathy who stops him from retiring as he wins his latest Premier League title. 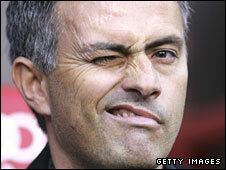 "I am not 'the Special One'. I'm the normal one. But my wife says I am special..."
Avram Grant has them rolling in the aisles in his first press conference as Chelsea manager. What is it with managers and their wives? "My players travel more than Phileas Fogg in 'Around The World In 80 Days'. Javier Mascherano had to play a friendly for Argentina in Australia. That must have been really important." Liverpool manager Rafa Benitez reveals his love of international football. "I'm ready to take the blame for all the problems of English football, if that is what he wants." The handbags come out early doors when Arsenal boss Arsene Wenger responds to Ferguson's dig about the Gunners' foreign contingent. "If Chelsea are naive and pure then I'm Little Red Riding Hood." Benitez agrees to disagree with Jose Mourinho's claims that Chelsea are whiter than white. "It was the fifth minute of their usual seven minutes of injury time." Ferguson takes exception to Arsenal's late, late equaliser against Aston Villa. "It is omelettes and eggs. No eggs - no omelettes! It depends on the quality of the eggs. "In the supermarket, some are more expensive than others and some give you better omelettes. So when the class one eggs are in Waitrose and you cannot go there, you have a problem." "I can't say we are the best in England but I don't think there is a team stronger than us." Avram indulges us with a nice line in doublespeak. "I haven't seen that. I don't know anything about it. I don't know what you're talking about." Wenger amazingly misses the on-field spat between Arsenal team-mates Emmanuel Adebayor and Nicklas Bendtner, witnessed by the rest of the universe. "As always I am focused on training and coaching my team." Benitez's statement - repeated at least 10 times during a press conference - after Liverpool's owners tell him to stop criticising their transfer policy. "The fire is always ready but now it looks as though you are burned on the village green quicker than ever before." Wenger gets fired-up about the number of managers getting the boot. "I think if we win and Arsenal and Chelsea lose, it will be a good day!" Fergie hopes for a miracle result when the Gunners visit Stamford Bridge. "It must be necessary for a player to bring a gun and shoot one of our men in the box for us to get a penalty." Man Utd assistant boss Carlos Queiroz keeps things in perspective after Cristiano Ronaldo's penalty appeal is turned down in the 2-1 defeat by Chelsea. "They searched the house and took a computer away that I bought my wife two years ago - I think she learnt to turn it on four weeks ago." Portsmouth manager Harry Redknapp comes over all PC after laying into police who raided his home during a 'football corruption' investigation. "I don't want to comment on who or what will take over my job at Newcastle." Former Newcastle boss Sam Allardyce, clearly not bitter about getting the old heave-ho. "I am sure we will see pictures of Sam in his Speedos walking along a beach somewhere. That won't be a pretty sight." Wigan boss Steve Bruce speculates on where Big Sam will pop up next... no-one wants to see that. "I've got more points on my driving licence." Derby manager Paul Jewell on his side's meagre total. "Once Ashley puts some weight on he will be fantastic. At the moment he's about three-and-a-half stone - a couple of times we have put him through the letterbox!" Aston Villa boss Martin O'Neill on what striker Ashley Young needs to keep on delivering. "I saw the celebration. Superman - super goal." Manchester City boss Sven-Goran Eriksson on cheeky Stephen Ireland flashing his Superman pants after scoring against Sunderland. "I was excited and it takes a lot to get me excited... ask my wife." Roy Keane is so excited - and he just couldn't hide it - after Sunderland's opening day win over Spurs. "If you took the goals out of it, I think it was pretty even." West Ham boss Alan Curbishley on the unlucky 4-0 hammering by Chelsea. "Even the chef's been out for two weeks with a hernia." Curbishley bemoans his side's luck with injury. "People said I was pitting my wits against Sir Alex Ferguson, but it is like using a water pistol to take on a machine gun." Birmingham manager Alex McLeish on dodging bullets at Old Trafford. 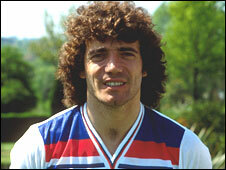 "It was a great result and it might stop people saying Newcastle have not won under Kevin Keegan." After beating Fulham to earn his first win back on Tyneside. "The only way we will get into Europe is by ferry!" KK quickly realises it isn't going to be plain sailing. Keegan - who writes his scripts? "We don't have to play them every week, although it seems like we have this week." After Newcastle's second defeat in a week against Arsenal. "The match for them is a bit like people down south going to the theatre. They want to be entertained." Keegan on the Geordies' passion for football, before putting on Much Ado About Nothing in his first game at St James' Park. "He's six-foot something, fit as a flea, good-looking - he's got to have something wrong with him. Hopefully he's hung like a hamster - that would make us all feel better!" Leicester manager Ian Holloway searches for a chink in the armour of the Portuguese superstar. "He's six-foot two, brave as a lion, strong as an ox and quick as lightning. If he was good looking, you'd say he has everything." The Adonis that is Paul Jewell gives his version. "The one thing Cristiano Ronaldo has is pace, quick feet and a great eye for goal." Chris Waddle pays his own unique tribute. "I don't like to look like this, but in four or five days I will be beautiful once again." Ronaldo may have suffered a black eye against Roma, but thankfully his ego remains unbruised. "Gary Neville is the club captain but has been injured for the best part of a year now - and Giggsy's taken on the mantelpiece." Rio Ferdinand was clearly having a hearth while describing the Man Utd captaincy. "I must admit I suffered a bit when I first came to England. But then I realised that there was nothing to be intimidated by, everybody had two legs." Liverpool midfielder Lucas had clearly been watching too many League of Gentlemen episodes before heading over from Brazil. "Over 'ere - on me 'fro, son!" "I was going to cut my hair the other week and if I had done we'd have lost 1-0, so hooray for afros." 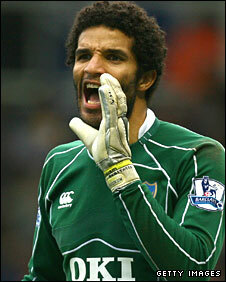 Portsmouth goalkeeper David James on denying Michael Owen with his crazy barnet. "Sometimes on a day off I go to the doughnut shop. When we play at home, I go there after the game and it's like a doughnut party! Everyone is eating doughnuts inside their cars - it's like a disco!" "Nothing surprises me in football, but if I said I was astounded that would be an understatement." Ray Wilkins on Jose Mourinho's departure from Chelsea. "If we're talking lookalikes, he's Toad of Toad Hall, isn't he?" Ian Holloway on Chelsea boss Avram Grant. "I think it's fair to say we're an improving team and a team that's getting better." Everton skipper Phil Neville, who also feels his side have come on leaps and bounds. "You probably think I'm Kenny Sansom!" Little Britain star Matt Lucas on meeting Arsene Wenger, after the Frenchman admitted he had never seen the show. "Most of the Portsmouth team are six foot plus and over." Graham Taylor commentating on BBC Radio 5 Live. 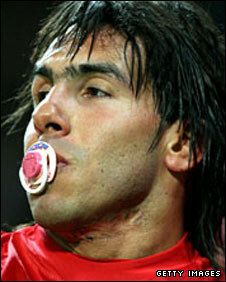 "I don't know where Carlos keeps the dummy. He produces it from nowhere." Manchester United midfielder Michael Carrick on Carlos Tevez's goal-celebration prop. Three guesses, Michael. "I don't follow football, I just love the name Aston Villa. What suburb of Rome is Aston Villa from?" Actor Tom Hanks on why he's a Villan at heart. "We're moving up the table now which is hopefully the right direction." Tottenham keeper Paul Robinson shows he's grasped the basics after Spurs beat Portsmouth. "We are happy with the three points, but it could have been more." Ryan Giggs after Manchester United's 2-0 win over Fulham. "Martin Jol was literally a dead man walking at Spurs." BBC pundit Steve Claridge, a vampire hunter in his spare time. "I prefer to frighten people by driving around in my white Porsche with Slipknot blaring out of the windows." Reading's American keeper Marcus Hahnemann when asked about the hoard of guns he keeps in the States. "Had I not become a footballer, I think I would have been a virgin." Peter Crouch's honest assessment of himself. Have Your Say: Are there any funny quotes we've missed out?